A very compact, fast responding electric heating element for liquids and gases for all clean, fuel cell, bio-med, laboratory, food, and pharmaceutical applications. 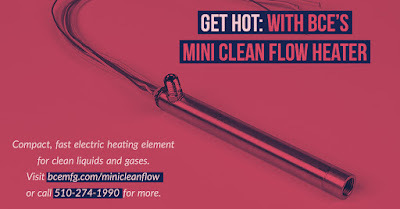 The heating elements inside the Mini Clean Flow Heater are isolated electrically from the process media, protecting them from contaminants and providing long life. 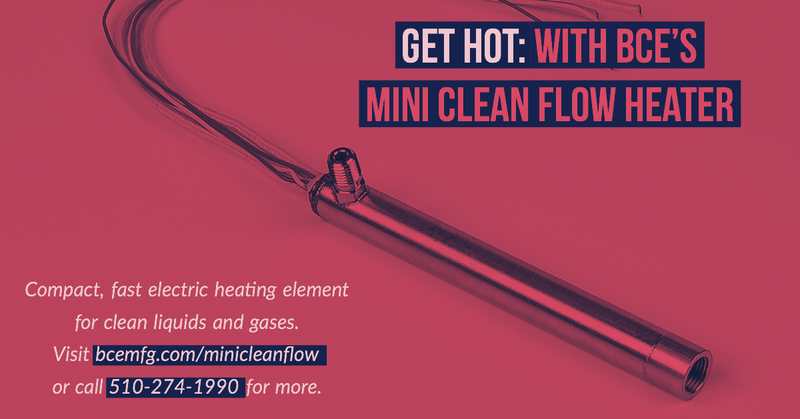 The Mini Clean Flow Heater operates in a liquid or gas stream providing very fast response times and accurate control capability. During the past decade, new epoxy compounds have been developed that rival glass and ceramic in performance. BCE is at the forefront of this development. With modern epoxy feedthroughs, any kind of standard or custom connector is sealed in a completely potted, high-performance, clear epoxy compound. Epoxy seals offer countless design options, and most amazingly, performance equal to or better than glass or ceramic. Better yet, pricing is very competitive and quick turn-around for prototypes and short production runs are not a problem. BCE can provide custom prototypes for your design with high vacuum performance for today's fast moving markets. Wide variety of standard and custom mounting options for epoxy vacuum feedthroughs. 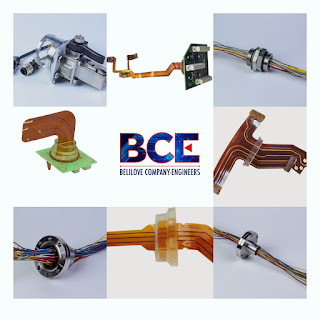 Fewer components and connectors, often reducing 5 components to 1, BCE epoxy feedthroughs also eliminate multiple potential failure points. BCE feedthroughs meet NASA outgassing requirements. BCE vacuum leak checks 100% of feedthroughs. Nichrome wire heating element inside a quartz tube. When an electric current passes through a conductive material (a resistor) energy in the form of heat is released. The greater the resistance to electron flow, the greater the heat energy created. The terms resistance and conductance apply to the nature of the conductive material, and it's ability to pass current. Resistance (measured in ohms and using symbol "R") is defined as the electrical voltage (in volts using symbols "V") divided by the current (in amps, using symbol "I"), or R=V/I. This formula is one variant of Ohm's Law. The heat, or power, released from the resistor (measured in watts, using the symbol "P") is a function of the supply voltage squared, divided by the conductor resistance. This version of Ohm's Law looks like this: Watts = Voltage squared / Resistance, or P=V2/R. You can see if the resistance is too high, voltage does not flow, and no heat is produced. For the benefit of simplicity, we'll forego a discussion into superconductors, like those used on MRI machines and mass spectrometers, because their behavior includes complicated magnetic field discussions. Instead, we'll stick to common conductors often used to pass electrical current. Selecting the right resistive material for a heating element is crucial in order to maximize heat output, heater longevity and energy usage - a conductive material with high resistance that is also easy to work with. Nichrome alloy, made up of 80% nickel and 20% chromium is by far the most popular resistance heater wire, and is a available in a wide variety of wire gauges and ribbon shapes. It's popularity is performance based - it has high resistance, is easy to apply to many heater configurations, does not oxidize, has a low expansion coefficient and a high melting point. In the design and development of electric heating elements, if you grant that nichrome wire is at the heart of most electric heaters, everything else comes down to packaging and performance. While there are other materials such as Kanthal (iron / chromium / aluminum) and Cupronickel (copper / nickel), and newer exotic ceramics, the vast majority of electric heaters used in industrial, commercial, OEM, and consumer goods all still rely on the ubiquitous and time proven nichrome alloy. For more information on electric heating elements, contact BCE by visiting https://bcemfg.com or by calling (510) 274-1990.